This is one of the most Johnny-friendly cards I’ve seen for a while. The fact that its triggers are restricted to creature spells does cut down the synergies slightly, but there are still lots of interesting ways to get extra effects and/or cause it to snowball into a huge incremental advantage. For example, Flametongue Kavu has four power and thus becomes a three-for-one when Sarkhan’s Unsealing is already in play. It is tempting to stay in red and use Sarkhan’s beloved dragons, but of course you don’t have to: I think the only thing better than getting Fact or Fiction on a creature or an enormous life-swinging finisher is getting those and destroying a bunch of opposing creatures in the process. Much like how Liliana likes her demons, Sarkhan likes his big and menacing dragons. 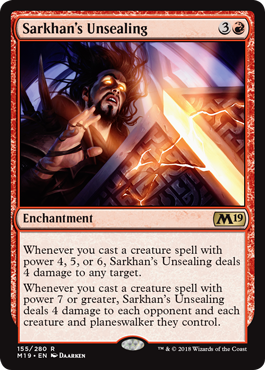 Sarkhan’s Unsealing is an enchantment that has no board impact when it comes down, so it had better have an effect that makes up for it. And it does! Kinda. It does, by and large, synergize well with Sarkhan’s favorite creature type (Dragons). Conveniently, Sarkhan’s Unsealing is positioned right before the big dragons are due to come down on the curve; a lot of them start at 5 mana. And the effect is nice: four damage to anything you please, like an opponent’s face, a planeswalker, or a blocker that might keep your dragons from swooping early and often. And this triggers on cast (thwarting counterspells) and on creature spells with at least 4 power, which is definitely manageable. The second part of the effect (a mass blast on the board) is less likely by and large, though I suppose Phyrexian Dreadnought might have a friend to play with…that said, it definitely is a solid way to make sure your big creatures have impact. Even if that bottom effect never fires, throwing 4 damage turn after turn at your opponents is a good way to go, and I can see this slotting into either Jund, Gruul, or mono-red Dragon shells. It’s a bit too slow for my liking to consider outside of Standard and casual formats, but it can make an impact all the same there.